With the Allume Social conference approaching fast, I felt like sharing my experience with being organized before arriving at your first or any for that matter...blog conference. This will be my first time to Allume, but not my first blog conference. 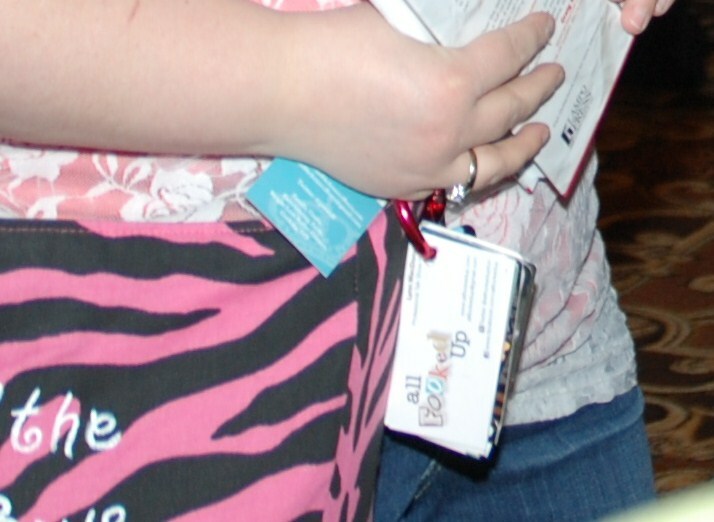 In February I attended Blissdom. I decided that I did not want to carry a computer to the sessions. Between my purse/bag, camera, papers, books....etc....it was just too much to lug around. I first started by buying a binder in my favorite shade of turquoise. Then I blinged it up. Here is "My Sparkly Bliss Book". First pages were the conference schedule with the sessions I intended on attending highlighted. This was helpful because I had the room numbers, speakers, etc available at moments glance. Then next...I planned out my wardrobe. I often over pack for trips. I will get home and have half a suitcase of clothes I didn't even touch. So I planned my outfits...down to even what bra I would need to where with the outfit. Proper support is imperative. ha! This also made packing a breeze! Next, I printed off the information from my Blissdom Newbie Facebook group that I thought was important. Mainly people that I had made connections with..and had hopes of seeking out during the conference. You can get inundated with information, business cards, names, blog names, twitter names, who's who's and whats whats...This just helped me put names and faces etc all together. Next I had blank notebook pages ready for note taking. I love computers...and typing...but I also LOVE writing with a pen and paper (especially blue or purple ink). I also had my conference tickets printed off and were ready and handy when I checked in on day one. My mother made me a tote perfect size for everything I needed to carry. On the outside I also had the name of my blog and my handmade shop written. For business cards I carried with me a big clip and a paper puncher. When I would get business cards I would punch a quick hole in the card and add it to my clip. At the end of each day I would make a point to go follow the new people on twitter and give them a quick shout out/thanks. I searched over my pictures and can't believe I didn't actually take a good picture of business card holder. Also...I did not think of this idea myself. I saw it somewhere...and I have absolutely no idea where now. Would be glad to give kudos if I could remember who it was. Thanks for stopping in and checking out a few of my blog conference organization tips! What other ideas do you have? If you are an Allume Social newbie attender...please join the Facebook group that I have started. It is a private group for conference newbies and a few seasoned alumni. We talk about fears, excitements, ask many questions, offer support...no question is too silly...small or big! Thanks for stopping by! Glad I could give a few tips for you to refer to! What a great idea with the business cards...Thanks for helping us get ready to make the most of our conference. This is great, I am not super organized but this will definitely help me out! I especially love you bag, what a great way to "Market" your blog too! I LOVE the business card idea!!! Wow, girl! You are seriously organized! Thanks! Now, I am going to start on mine. You have been amazing with all your help. Thanks for helping out the the newbies! Just shared these tips with the Declare Conference group. I love how crafty you are. Such great tips - thank you so much for sharing!